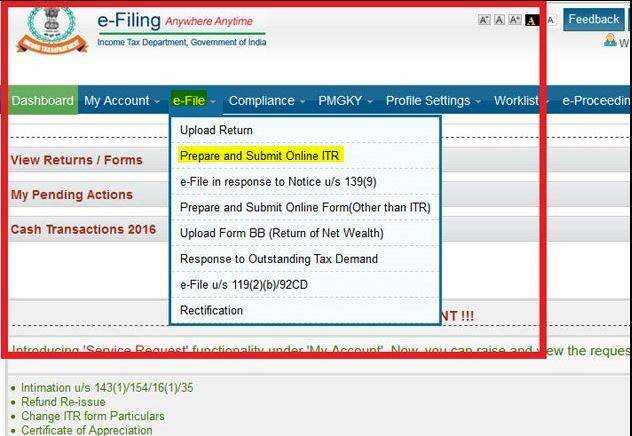 People with salary income who are eligible to use ITR 1 or ITR 4 form can file their tax return completely online via the income tax e-filing website without having to download any form/software. Using this method, a person can fill the form online by entering the relevant information and finally submit it online as well. This step by step guide will help you do the same. 2. If you are a first time user or filing your returns for the first time then click on the 'New Registration' tab and register yourself by providing relevant details and creating your profile and password. While creating your user ID, you must ensure that you have an active e-mail id and mobile number and it is mentioned correctly. It is important as communication by the department will be sent on this. Registration will be completed by clicking activation link sent via email and providing one-time password (OTP) received on the mobile. Click on the 'Registered user' if you have already registered yourself on the website. For any assistance, one can click on 'Customer care tab' to get the helpline number and call the customer care centre. 3. Next click on login tab and enter the required details: your user ID i.e. your PAN, password, date of birth (mentioned on the PAN card) and captcha code. Click on log-in button at the bottom to sign in. 4. After signing in, your account dashboard will open up as shown in the picture below. 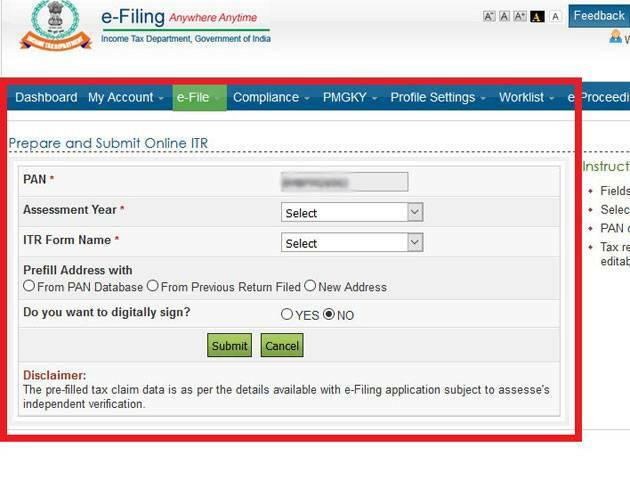 Click on the 'e-file' tab and select the 'Prepare and submit ITR online' option. 5. Next, select the relevant form and assessment year for which the return has to be filed. Here taxpayer can pick his address either from the PAN database, from previously filed return or fill in new address. The department here asks you whether you want to digitally sign your return. If selected 'Yes', you are required to upload your signature which needs to be pre-registered at the income tax website. 6. Click on the 'Submit' button and the website will redirect you to the page for filling the form selected by you. Before starting to fill the ITR form, one should read the 'General Instructions' given at the start of the form to know do's and don'ts. 7. After that you will be asked to fill in required information in different tabs i.e. General information, Income details, Tax details and taxes paid in the ITR form. One should ensure that the Tax payable shown in the online form matches your calculations. 8. Before making a final submission, it is advisable to save the data entered and recheck it to avoid any mistakes. Once 'Preview and Submit' button is clicked, your form will appear allowing you a preview of your ITR form before final submission is made. 9. 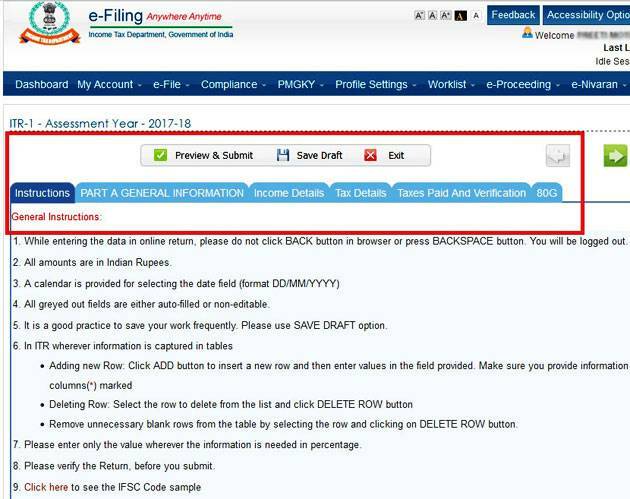 Once the 'Submit' button is clicked, your ITR will be uploaded and you will be asked to verify your return using any of the options available. 10. If you have already registered your digital signature, you will be asked to upload the same while submitting your ITR at the final step. Once it is uploaded and submission has been made, process of ITR filing is completed and no further verification is needed. You will not be required to send acknowledgement/ITR V in physical to CPC, Bengaluru. 11. 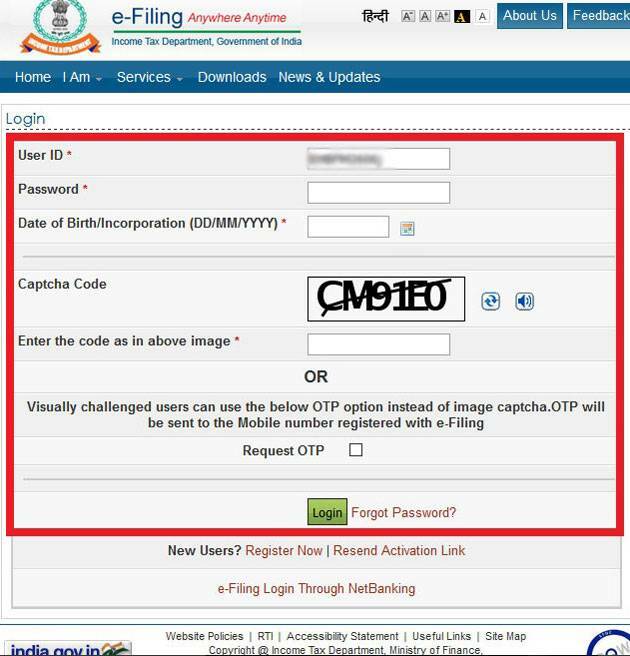 However, if you do not have/haven't uploaded the digital signature while filing the return, then you can verify your return either electronically using Aadhaar OTP or Electronic Verification Code method or by sending a signed print out of the ITR V to CPC, Bengaluru within 120 days from the date of e-filing. 12. 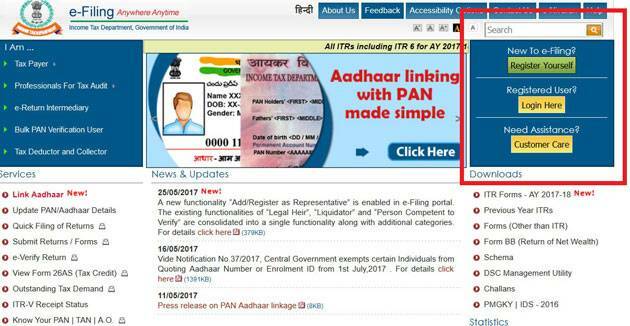 An Acknowledgement/ ITR V will be simultaneously sent to you on your registered email ID once your return is successfully uploaded. This acknowledgement will also show up in your account on the e-filing website from where you can download it if required. 13. The department will process your ITR once you verify it. After your ITR is processed, you will be intimated about the same via mail and sms on your registered mobile number.